Nestled in the heart of the East End within the flourishing cultural landscape of Hackney Wick, Number 90 is a stunning, spacious canal-side bar and restaurant. Here at Number 90, we offer great food made from locally sourced produce and an expansive drinks menu – including an innovative cocktail list and a strong range of craft beer. Inside is kitted out with a hand-crafted bespoke wooden decor and our famous giant disco ball, while outside we have our beautiful terrace on the canal. 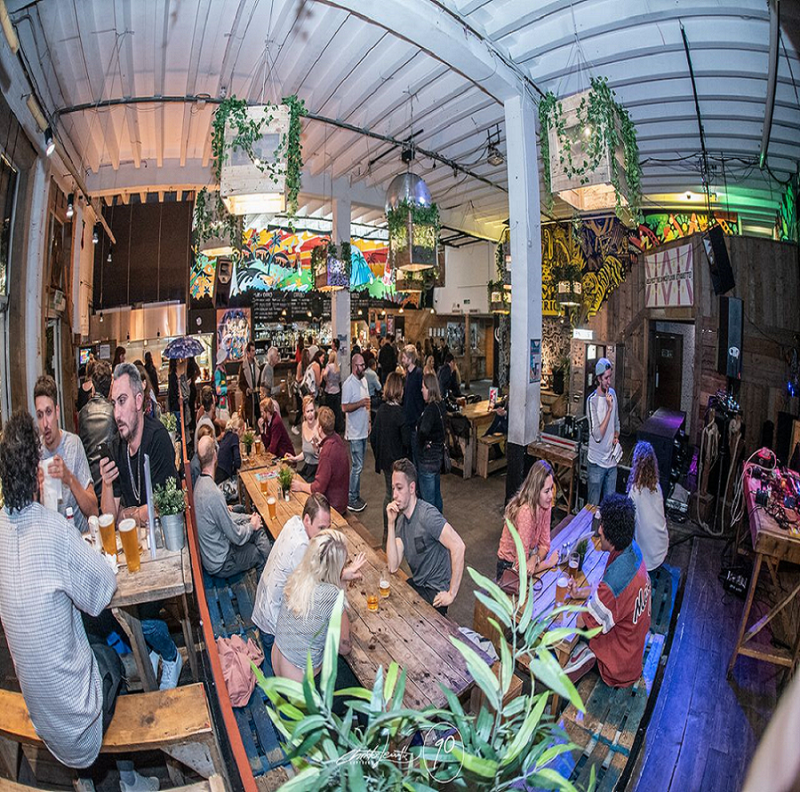 With an event’s programme celebrates the best local and international music, art, comedy, film, theatre and more, Number 90 has become something of a Hackney institution. The venue was awarded the ‘Best Local Business’ at 2014’s Mayor of Hackney’s Business Awards and Time Outs Love London Awards. Number 90’s ever-evolving space and events programme is set to excite and delight. Welcome to the family, we hope you enjoy! Based in Hackney Wick, one of London’s most artistic locations, Number 90 stays true to its roots and has one of London’s most iconic murals at the front of the building. Inside you will find 90 Gallery, a small in-house gallery where Number 90 exhibits monthly exhibitions from local, up and coming, and established artists. The venue is filled with creativity and offers some unique and vibrant pieces decorating the venue from head to toe. Number 90s has an eclectic music culture, showcasing some of London’s finest DJs on a weekly basis. We have residents of the likes of Phonica Records, Rough Trade, Dom Servini, Chris P Cuts and many more. The music policy varies from Indie, Roots Reggae, Funk, Soul, House and Disco – there’s always a beat for everyone. Music is a very important part of Number 90 culture and we transmit this love throughout the space all year round. Number 90 kitchen’s head chef, Stefan, has a passion for creating exceedingly tasty food. Being Romanian his main influences are drawn from the Mediterranean, but he is also proud to offer a strong menu catering for Street Food, Gluten Free and Vegan dishes. Our menu changes seasonally, using fresh and local produce. We are famous for our TNG Burger where we offer 2-4-1 Burgers on Thursdays, as well as our Sunday Roast and we deliver every week with no exception. The kitchen offers small and large plates to accompany you whilst sipping on one of our signature cocktails or locally crafted beer. You will find also a great selection of healthy yet naughty deserts. We offer some of the best beer from local craft brewers and also some of our international favourites. Expect innovative, fun, tasty cocktails to take you through the night (or day) which are carefully tailored to each season. Number 90 is always pushing the boundaries to ensure we are providing our customers with the freshest and most delicious drinks available!